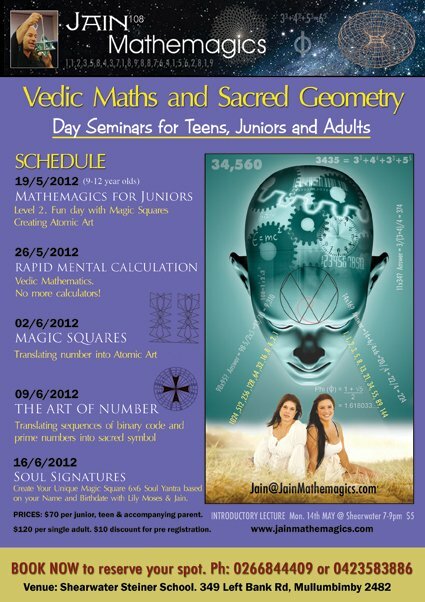 Here is the flyer schedule for ONE DAY SEMINARS WITH TEENAGERS. Also included are days with JUNIORS (ages 9 to 12) and ADULTS. Please click here to print out and complete the Registration Form, and bring it with you to the Event. VENUE : At the Shearwater Steiner School, Mullumbimby. Come to a 2 hour Introductory Lecture about these courses on the Monday the 14th May 2012, from 7 to 9pm at the Shearwater Steiner School, 349, Left Bank rd, Mullumbimby). We have just finished Term 1 of 2012, with privately taught students improving their Rapid Mental Calculation skills. Each school term runs for a period of around 9 weeks, and when Term 2 of 2012 arrives, we are offering 5 one day seminars on other fascinating topics weaving in Geometry, timeless Number Patterns, and the Translation of Number Into Art which will fascinate both students and their parents. (The other 3 topics that are taught, will be available in Term 3 of 2012 and are listed below this Schedule). Special $10 discount per person for each pre-paid Registration. VENUE : At the Shearwater Steiner School, 349 Left Bank rd, Mullumbimby. COSTS : $10 reduction for all day seminars that are prepaid + includes a 30 page booklet per class..
$120 for the day for a single adult. $100 if you attend more than one seminar. Saturday, 19th MAY, 2012 10am till 3pm. Magic Squares have fascinated many cultures for thousands of years. Come and learn about this special Magic Square of 3×3 and how the 9 numbers, when translated into Art, creates the Atomic Structure of Diamond. – No more Calculators! Do Maths in Your Head like a Genius. Saturday, 26th MAY, 2012 10am till 4pm. (Level 1, Introductory). Learn some of the 16 Vedic Sutras or formulas that solved most mathematical problems. Boosts confidence and develop Memory Power to assist students to gain the leading edge in their exam requirements. A dedication to the late Indian Pope Bharati Krsna Tirthaji whose vision it was to introduce this system to the western world in the 1950’s but was subsequently quashed or buried, but now the knowledge is being revived and released. nb: Due to popular demand, this Day Seminar is a repeat of the one held in Term 1. Saturday, 2nd JUNE, 2012 10am till 4pm. (Level 1, Introductory). Theory on Magic Square Sums and Harmonics. Drawing mandalas based on the Magic Square of 3×3 and 4×4 and 7×7. History of Magic Squares and case studies celebrities like Benjamin Franklin who gave the world some of the most elegant magic squares arrangements ever created.Masterpieces with Numbers. The Magic Square of 3×3, composed of 9 numbers whose sums of rows and columns and diagonals all equal 15, is a portal into the Higher Mysteries, and is the key to all Feng Shui systems that focusses on the aesthetic art of placement of objects. Be surprised by a theatrical ending during this seminar! Translation of Number into Art and Sacred Symbols. Saturday, 9th JUNE, 2012 10am till 4pm. (Level 1, Introductory). Study the symmetries hidden in the Doubling Sequence or Binary Code 1-2-4-8-16-32-64-128… when plotted into the 9 Point Circle; and the 4th Dimensional Templar “Maltese” Cross embedded in the infinite Prime Number Sequence 1-2-3-5-7-11-13-17-19-23… when plotted into the Wheel of 24. The Universal Language of Shape and Pattern Recognition.
. Very rare knowledge, once held secret and guarded, is now available, to help understand that Mathematics is the base or derivation of all known symbols like the pentagram or Star of David or Golden Spiral. Saturday, 16th JUNE, 2012 10am till 4pm. (Level 1, Introductory). Term. These 4 Levels will repeat again during the 4 Terms in 2013. These are all Introductory or Level 1 classes, so that when the next programme begins in Term 3 of 2012, the students that attended these courses during Term 2 can go to Level 2 or more Advanced, on the same topics. “Teens” here means teenagers from the age of 13 to 19 years of age. The Fibonacci Numbers and the Living Mathematics of Nature. 2012: 10am till 4pm. (Level 1, Introductory) . Discover the important 108 Code hidden in the Fibonacci Sequence: 1-1-2-3-5-8-13-21-34-55-89-144… and the Phi Ratio 1:1.618033… that is seen in the flowers, the distances of the planets from the sun, and the precise location of where the elbow bends. Lots of hands-on activities and diagrams to be drawn. Learn the true definition of “Fractal”: what it means when “the Inside is the Same as the Outside”! Learn the deeper meaning of the Pentacle, the pattern of the seeds seen inside the apple core: The shape of every biological Protein is a pentacle shape! The 5 Platonic Solids – key to Atomic Structure. 2012: 10am till 4pm. (Level 1, Introductory). This is the secret geoomtry of crystals that was studied by Pythagoras’ students 2,500 years ago. Learn how Kepler in the C16th nested these 5 Platonic Solids, like the embedded Russian dolls, to reveal prized knowledge guarded by the ancient seers. Quantum Physics today is coming to terms with what the ancient alchemists knew thousands of years ago: that “Shape Stores Memory”. Learning and creation of the Nautilus Shell Golden Mean Spiral that will edcuate the child to see the natural and inherent Beauty of Numbers and the pure Joy that its visual understanding gives. Due to some recent interest, I plan to offer educational, fun and exploratory classes for children as young as 5 and up to 8 years of age. They will be learning Numbers as Shapes, and draw Magic Square patterns with String etc….They even get to learn what a Tetrahedron is! I am planning to make a dvd of this subject so that parents can get some great ideas how to begin teaching children, at a very young age, the wonders and Joy of Numbers. nb: Some interested parents in the Gold Coast, Brisbane and Sunshine Coast areas have enquired about running these classes privately in their large spare room or local hall. This is a good option but must have a minimum of 20 students. Bookings for each Saturday class are required to be confirmed and paid for one week before the specified date. All Cheques are to be made out to: JAIN F.R.E.E.D.O.M.S. “For Research Expressing Essential Data Of Magic Squares”. Some theory is taught, some powerpoint presentations but mainly these seminars are hands-on lesson that improves artistic, mathematical and constructional methods. good quality compass, (not the cheap ones which are useless) pens and pencils and colours, rulers and erasers. A 30 page Workbook, valued at $10, is supplied. Small Groups are best for one-to-one interaction, so a maximum of 20 people is preferred, so book early to guarantee your seat. (parents are encouraged to bring a plate of healthy cake, sweets or treats for all to share). BYO Lunch and fresh water. These 4 lessons held for Term 1 in 2012 will repeat again over 4 Saturdays during Term 2 in 2012. These introductory lessons are classified as Level 1. According to their popularity, for those students who completed Level 1 and who want to learn more advanced knowledge on the same topics, Level 2 or Advanced Classes will be offered on Sundays.